Sequential Window Acquisition of all Theoretical fragment ions (SWATH) is a brand new mass spectrometry technology co-developed by Dr. Ruedi Aebersold research group (ETH Zürich) and AB SCIEX. SWATH data is an independent acquisition (DIA) technique. Unlike data dependent acquisition technique, which only selects certain MS spectrum for MS/MS detection, SWATH analyzes all MS and MS/MS spectra, allowing detection of virtually all detectable proteins in a sample. In SWATH technology, MS spectra are divided into several narrow windows and peptides in each window are sequentially analyzed equally, followed by MS/MS analysis. 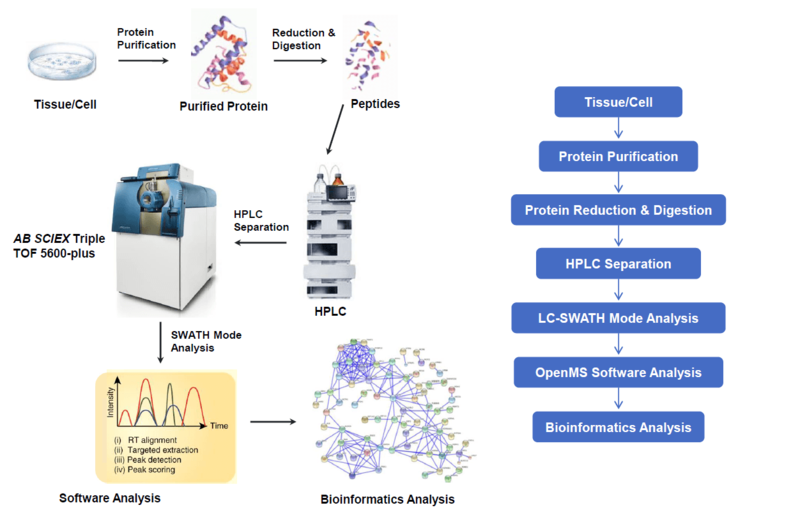 SWATH technique combines the high-throughput quality of shotgun proteomics with high accuracy comparable to MRM. To better meet our clients’ needs, MtoZ Biolabs offers a comprehensive SWATH service, including optimized sample preparation, high-quality SWATH mass spectrometry analysis and professional bioinformatics analysis.